When you get the SQL Running “NO” error, do not use slave skip counter as shown below. The above statement will skip one sql statement and execute the next statement found in the binary log file. When you get the following “Could not parse relay log event entry” error, it means that Relay log file is corrupt. The IO thread is running and SQL thread is stopped. SQL thread may be broken due to 2 reasons. 1) SQL statement can not be executed. 2) OR slave is stopped due to Relay log event entry. 1.1) In case of first case use skip counter statement. 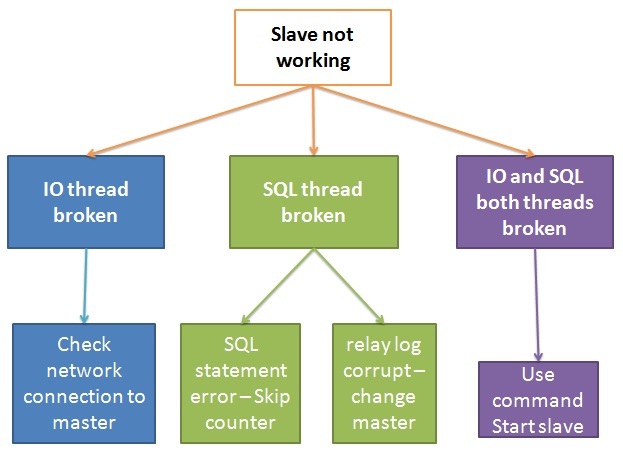 1.2) In case of second case when SQL relay log is corrupt you need to restart the slave by using “change master to” statement as shown below. Master log file and Master log position can be found in the show slave status output. Last_Error: Could not parse relay log event entry. The possible reasons are: the master’s binary log is corrupted (you can check this by running ‘mysqlbinlog’ on the binary log), the slave’s relay log is corrupted (you can check this by running ‘mysqlbinlog’ on the relay log), a network problem, or a bug in the master’s or slave’s MySQL code. If you want to check the master’s binary log or slave’s relay log, you will be able to know their names by issuing ‘SHOW SLAVE STATUS’ on this slave. The master IP address along with username, password can be found in master.info file. Relay log info file has the binary log file name and position. These 2 files are found in MySQL data directory. In this case these files can be found in /var/lib/mysql/ folder. In the following case skip slave counter command was used to skip the SQL error and go to the next command from binary. pv command allows a user to see the progress of data through a pipeline, by giving information such as time elapsed, percentage completed (with progress bar), current throughput rate, total data transferred, and ETA. To use it, insert it in a pipeline between two processes, with the appropriate options. Its standard input will be passed through to its standard output and progress will be shown on standard error. When it comes to MySQL, your restore rate is going to be different based on some different factors, so the ETA might not be entirely accurate. * If the address is 0.0.0.0, the server accepts TCP/IP connections on all server host IPv4 interfaces. * If the address is a “regular” IPv4 address (such as 127.0.0.1), the server accepts TCP/IP connections only for that particular IPv4 address. Save and close the file. Next setup the firewall and allows connection from or to select IPs only. If you have very large mysql database then it is very hard to backup and restore using the conventional phpmyadmin or any other programs. If your mysql database is very big, you might want to compress the output of mysql dump. Just use the mysql backup command below and pipe the output to gzip, then you will get the output as gzip file. January 19, 2012 Posted by unixserv | MySQL	| how to, MySQL | Enter your password to view comments. Method 1. How to Change MySQL Root Password Using mysqladmin Command? You can change the MySQL root password using mysqladmin command as shown below. Please note that there is no space between -p and currentpassword. Once you’ve changed it make sure you can login with your new password successfully as shown below. Method 2. How to Change MySQL Root Password From MySQL Prompt Using UPDATE SQL Command? Use the UPDATE Command to change root password. Method 3. How to Set MySQL Root Password Using mysqladmin Command? This method works only if there is no password currently assigned for the root account. If you don’t have any password assigned to the root account, set the password without giving current password as shown below. How to Change MySQL Regular User (non-root) Password Using mysqladmin Command? How to Change MySQL Regular User (non-root) Password From MySQL Prompt Using UPDATE SQL Command? 1. Switch off the database server while we are moving the databases. 3. Now it is better to copy the database first, rather than move. 3. add the following lines. If they already exist, edit as below. 4. Now start the database server. “Access denied for user ‘root’@’localhost’ (using password: YES)”. In that case we need to remove mysql from server and reinstall it by using following commands. Now you will able to access mysql without any problem. Some time above solution also not allowing to access mysql still throws following error message. In that case refer following steps but carefully as it will cause you database loss. MyTop is one of the best MySQL monitoring tools available, Its vital for monitoring your MySQL health, especially in a shared hosting environment. Installation on a RHEL/CentOS (for cPanel) server is quite straight forward with this guide. InnoDB: No valid checkpoint found. InnoDB: to create the InnoDB data files, but log file creation failed. Check the InnoDB engine status now. It should be enabled now. If still you have problem then check the ownership for session directory present in /var/cpanel/userhomes/cpanelhorde directory. Session directory should be cpanelhorde.cpanelhorde ownership recursively. 1. Basically, you will need to compile pear and mysql from your Apache. Run the command as below to get it updated. 2. Open your php.ini file and insert the line as below. 3. Restart the Apache services. .FRM –> file contain the table schema. .ISD –> is the file that actually holds the data. .ISM –> is the file that provides quick access between the two of them. MySQL is a full-featured relational database management system. It is very stable and has proven itself over time. MySQL has been in production for over 10 years. – MySQL is a multithreaded server. Multithreaded means that every time someone establishes a connection with the server, the server program creates a thread or process to handle that client’s requests. This makes for an extremely fast server. In effect, every client who connects to a MySQL server gets his or her own thread. – MySQL is also fully ANSI SQL92-compliant. It adheres to all the standards set forth by the American National Standards Institute. – Another feature of MySQL is its portability, it has been ported to almost every platform. This means that you don’t have to change your main platform to take advantage of MySQL. And if you do want to switch, there is probably a MySQL port for your new platform. – MySQL also has many different application programming interfaces (APIs). They include APIs for Perl, TCL, Python, C/C++, Java (JDBC), and ODBC.